You’ll enjoy the fresh taste of this classic soup. You can adjust the amount of extra virgin olive oil & lemon juice to taste and don’t hesitate to add more broth if need be to reach a desired consistency (the water content of zucchini can vary quite a bit). I really do prefer freshly ground white pepper in this recipe. 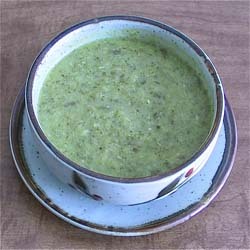 It is a variation based on a Mid-East zucchini soup recipe from an old college friend, Nancy, in Cranston, RI. Every time I make it I think of her & her family and good times spent in New England in years past. Not only is this soup aromatic while cooking; it is also very satisfying, taking the edge off anyone’s hunger with a rich mouth feel as well. Here’s hoping you & your family enjoy it as much as mine does. Steam broccoli in a microwave safe dish in microwave on high until crisp-tender following instructions for that particular microwave, first cooking trimmed sliced stems, removing cooked pieces to a separate bowl and then cooking the florets, keeping them facing inward so that florets don’t overcook. Heat olive oil in a dutch oven/soup pot and lightly saute sliced onion and crushed garlic. Add zucchini, steamed broccoli florets and stem pieces. Simmer 10-15 min. on low heat. Add chicken broth, parsley, and white pepper. Simmer 15 min. more. Allow soup to cool slightly, then stir in lemon juice. Puree using an immersion blender or if you prefer to use a stand blender, do so in small batches (1 cup at a time).